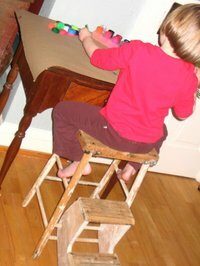 I read a post today that Amanda had written about a favorite corner in her home, one where her children played and created; one filled with lots of memories. It has inspired the idea of ‘corners in my house’–a time to share special places in our homes that bring warm memories, favorite places that make home a special place. 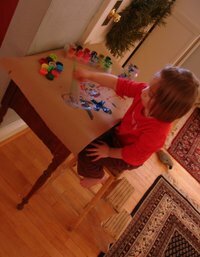 An old sewing table pushed against the wall, waiting to find a new location after some furniture rearranging; a beat-up stool purchased in college at an auction in the middle of a field on the eastern shore; some brown craft paper, a jelly jar of water, some poster paint and a creative four year-old. The perfect nook for a little creativity. 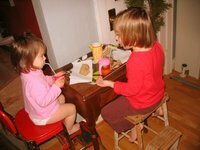 Then, an hour later, the table had a new purpose–take away the paints and paper, add a red vintage step stool, a tray filled with peanut butter toast, apple juice in cups with straws and heart-shaped ice cubes, and a little sister. And now another favorite place is created. There’s a growing ‘corners’ group here on flickr. Your girls are so cute. I love the way Emma is trying to “teach” Mary, is that universal of Emma’s to want to do all the explaining?? : ) thanks for showing your corner. That is so sweet, I love this idea of showing special places in your home. 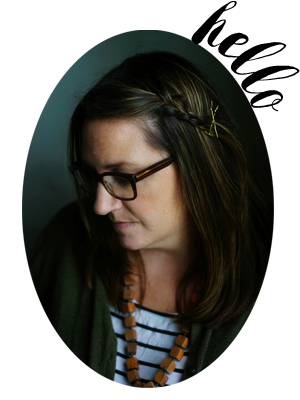 I also wanted to thank you for the comment you posted earlier on my blog about pre school. It reassured me and encouraged me that everything will be alright. Thanks. I love these pictures, I can see my girls starting to interact like that and it makes me soo happy I did not decide to stop at 1. BTW is the sewing machine still in that table? such a lovely little peek into your home… and such a great idea! Next Next post: O Henry!